Unifin International, Subsidiary of Koch Industriesansformer Oil Pumps are offered in both centrifugal and axial flow models. Flange sizes for our centrifugal pumps range from 2 x 2 in. to 8 x 8 in. The axial flow pumps are available in 6 x 6 in. and 8 x 8 in. sizes. The complete line consists of 18 standard models, all offered with a variety of customer-specified optional features. Heavy Duty class 30 cast iron is used for the pump casing, motor enclosure and impeller to provide long life. Pump and motor units are pressure tested to 50 psig to establish the integrity of the complete unit. Mottor windings are Hi-Pot tested for 60 seconds at (2x voltage + 1000), to ensure the electrical integrity and continuity. 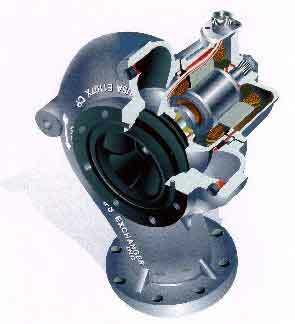 Impellers designed to permit thermosyphon flow, when the pump is not operating. This allows natural convection even when the pump is shut off. The pumps continuous duty operating temperatures are –40°C (-40°F) to + 100°C (+212°F). Winding resistances of the motor are taken before and after the pump is built, to ensure the integrity of the product.